It’s been quite awhile since I’ve posted any updates to the Golf Cart Light Stand. For the most part, it’s been working and I take it out when I don’t have an assistant with me and I know I want to do some creative lighting for my shoot. A couple weeks ago, I got an email from Bruce Chester (aka “Bruce Chester, photographer based in central California”) asking me if I still had the the how-to on doing the portable light stand, and we went back and forth talking about the original design. And lo and behold, a week later, he sends me his detailed how-to on how he was able to make it sturdier and make it strong enough for his Paul C. Buff setup. I thought his design was very well-thought out, so I’ve asked Bruce if he wouldn’t mind sharing it here, and he didn’t. Here is my creation – I call it the PhotoMobile. It rocks! 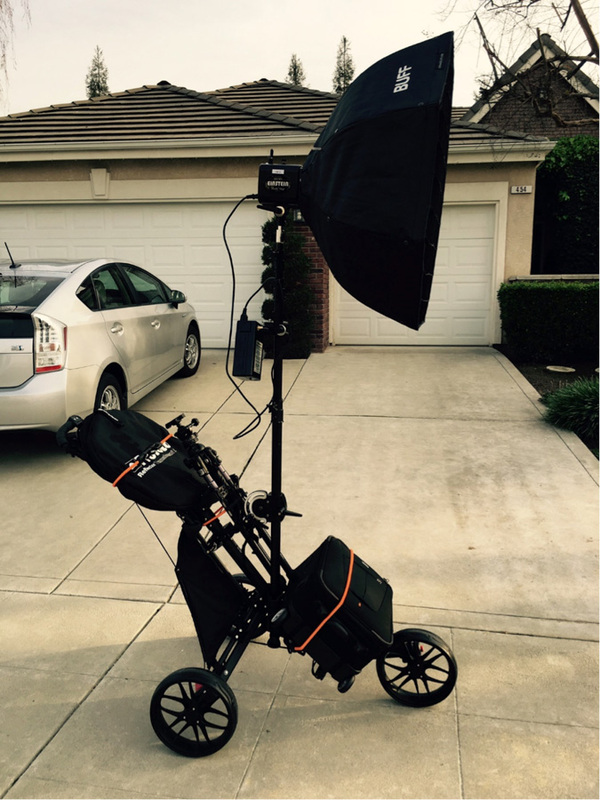 I started with the CaddyTek EX-Fold 3 Wheel Golf Cart. Got it from Costco – $120. This has a much beefier frame, wider wheelbase, and two flat frame rails along the base (“base rails”). It also has larger wheels, and the whole thing folds up quite small. It rolls easily and is quite stable and well balanced. It even has two zippered compartments on the back for cold drinks, etc. The Impact Reflector Holder is solid but proved to be too thin for my purposes, so I pirated a light post from an old Photogenic Black Talon light stand. This post is beefy – 1 3/8” diameter at the base, has air cushioned sections, and extends to over 11 feet high. I added an Impact Junior to Baby Pin Adapter ($9) to the top of it to give a bit more heft connecting with my Einstein 640. 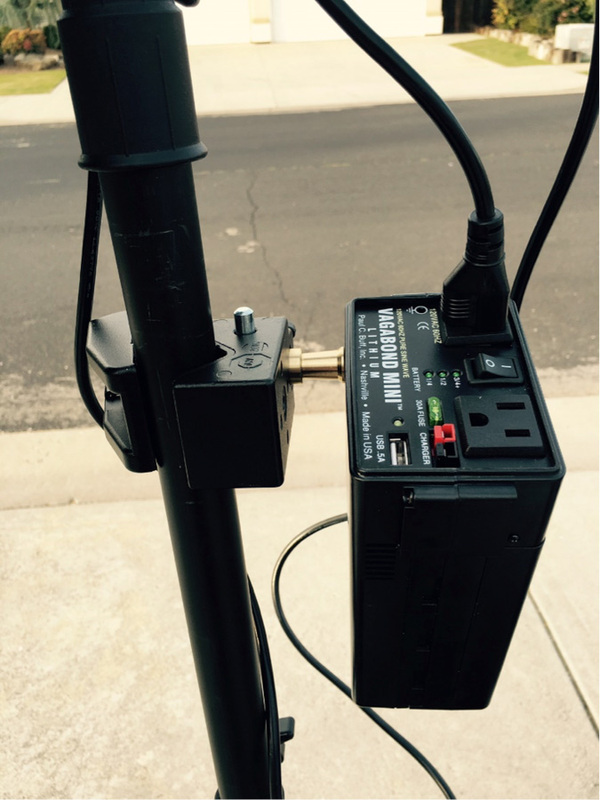 To connect the light post to the cart, I placed an Impact SuperClamp ($20) on the cart’s massive down post, an Impact LSA-TBC Tilting Boom Clamp ($40) around the light post, and connected them together with an Impact 4.7” Snap-In Pin ($3.75). 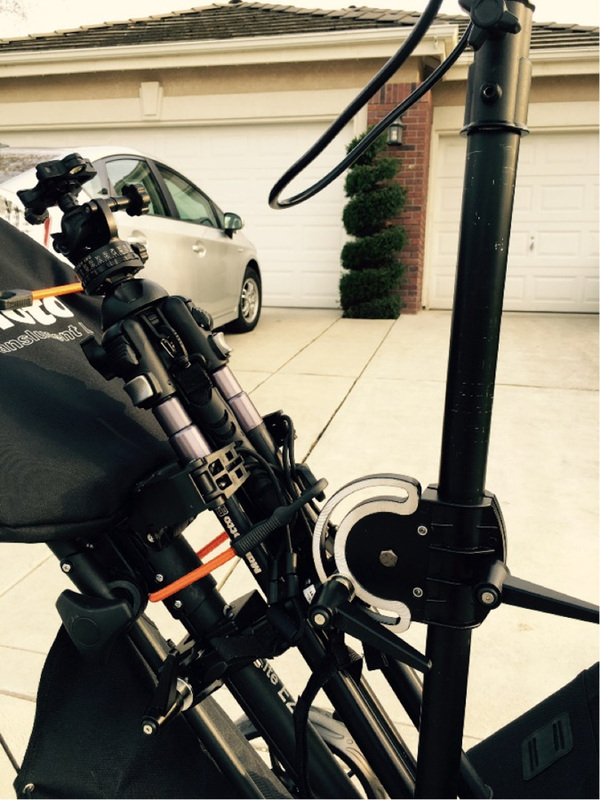 Placing the SuperClamp high on the cart’s down post gives a nice vertical hold – very solid. 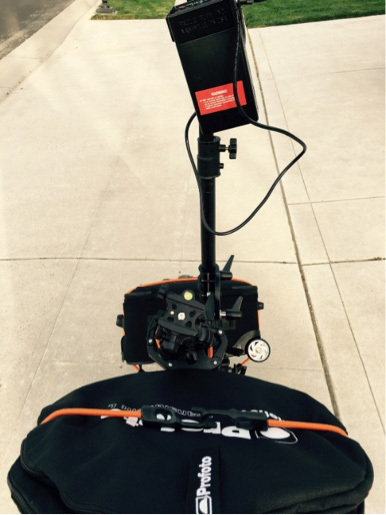 The SuperClamp can stay on the cart when folded – the 4.7” stud and Tilting Boom Clamp stay together on the light post. To secure the bottom of the post, I used the cart’s umbrella holder. The base of the post fits right inside of it, and tightens snugly with the umbrella holder’s side knob. 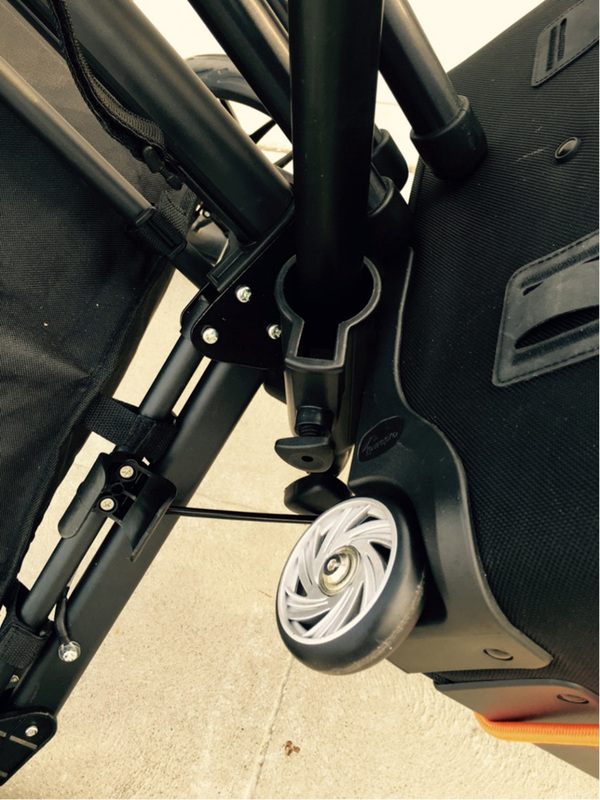 The umbrella holder sits perfectly on the cart’s right base rail. I used the right base rail to maximize stability, since the cart’s front wheel is slightly on the right of center. When the umbrella holder sits down on the flat base rail, it’s rock solid. The bottom knob fits right inside of the steel support rod, and the holder won’t move up, down, or sideways. No Velcro or screws needed. Easy peasy. 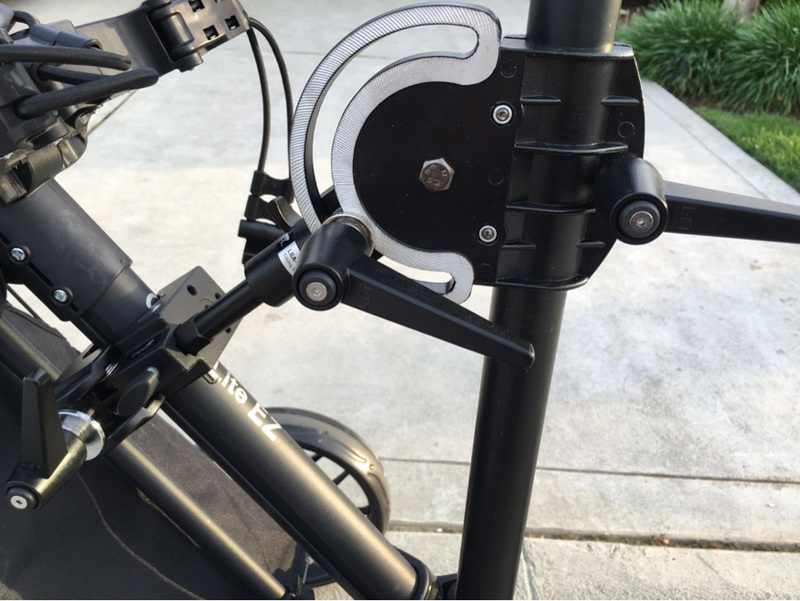 BTW – This whole light post assembly ends up right in the middle of the cart, perfectly balanced without ballast. Amazing! 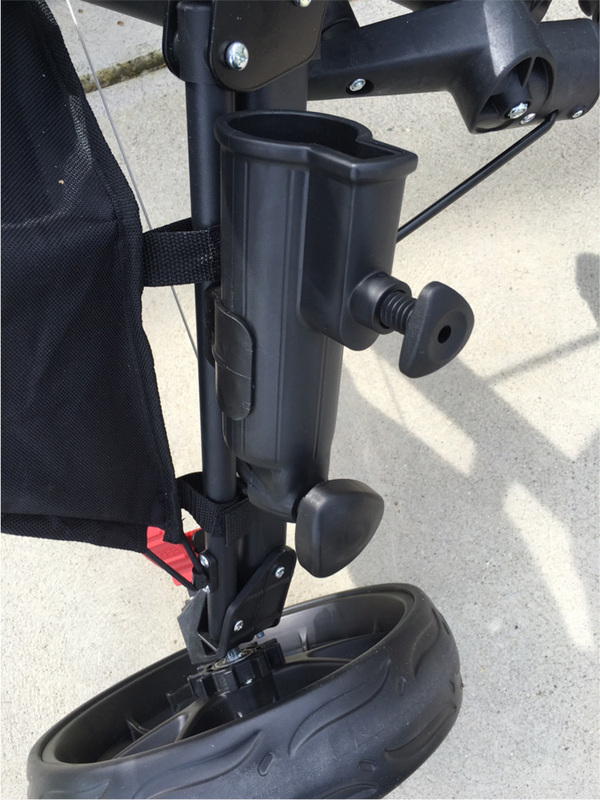 When not in use, the umbrella holder snaps right in its carrier, on the cart’s lower right leg. See photo below. I mounted my Buff Vagabond Mini Battery Pack directly to the light post. I found the Buff clamp was a bit too small for the big post, so I used another Impact SuperClamp, which comes equipped with a small brass stud with ¼” male threads on the other end – this screws nicely into the Vagabond’s clamp socket. Sweet! 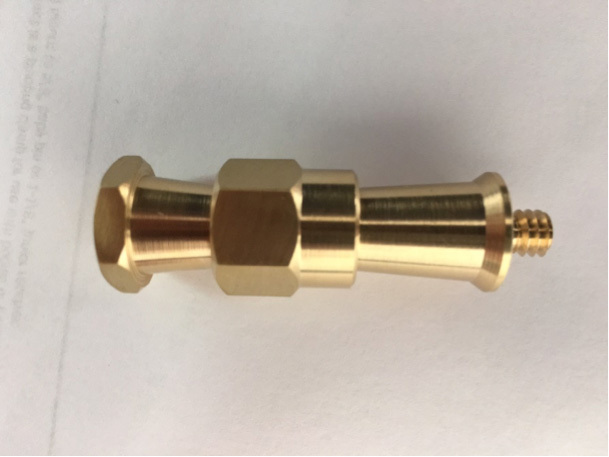 This is the 2” stud with ¼” male thread that comes standard equipment with the Impact SuperClamp. For $20 – a much better deal than the Manfrotto SuperClamp with no stud. BTW – I found the Einstein 15’ power cord way too long for this rig, so I substituted a normal computer power cord, 6’ in length. Much cleaner fit. The Einstein 640 sits securely atop the Black Talon post. I attached my Buff 37” folding octobox. It is nicely balanced and rotates 360° easily. I suppose that a 7’ umbrella with a diffusion sock would work equally well, on a calm day or indoors. I usually use the Einstein Cyber Commander to trigger the strobe, but the PocketWizard MC-2 ($101) will plug into the top of the Einstein and allow you to shoot high-speed sync and your choice of manual or TTL. 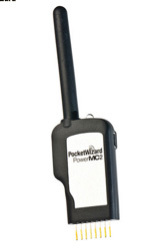 But you have to also have the PocketWizard on-camera Mini Transmitter and AC3 Controller. Pretty cool. The light post is shown here extended only 1’ to allow the battery pack connection. But it will go 11’ high. This fall, I am shooting a season-long photo essay for a university volleyball team, so I am sure this rig will find itself way up high during practices and photo days. I may opt for the 7’ umbrella for that. I shoot with a Lowepro X100 AW roller case on location. It’s a good carry-on, with lots of sections and compartments for cameras and lenses. I was pleased to find that it fits perfectly on the front of the cart, right on the two prongs there to hold a golf bag. I use a 40” bungee cord to secure it when rolling, with the bungee passing through the top handle. Otherwise the bag just sits on the cart holding my cameras and lenses in easy reach. Plus its weight does add nice ballast to the rig. The top edge of the camera bag leans against the umbrella holder just enough to give the light post even more stability, as you can see in this photo. Also, notice how the tripod legs rest on the bag. As you can see, any assortment of tripods, monopods, and/or light stands can be carried above the cart’s center post. 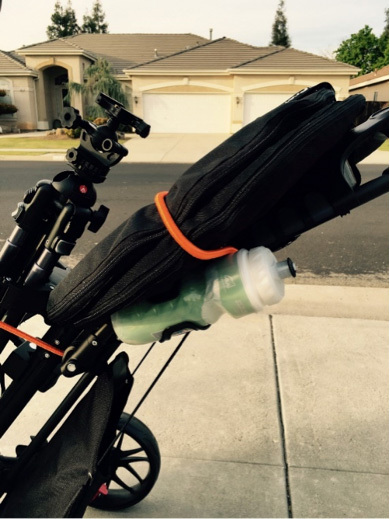 I just close the golf bag holder arms around them – you can add a bungee cord around them for extra security if you want. 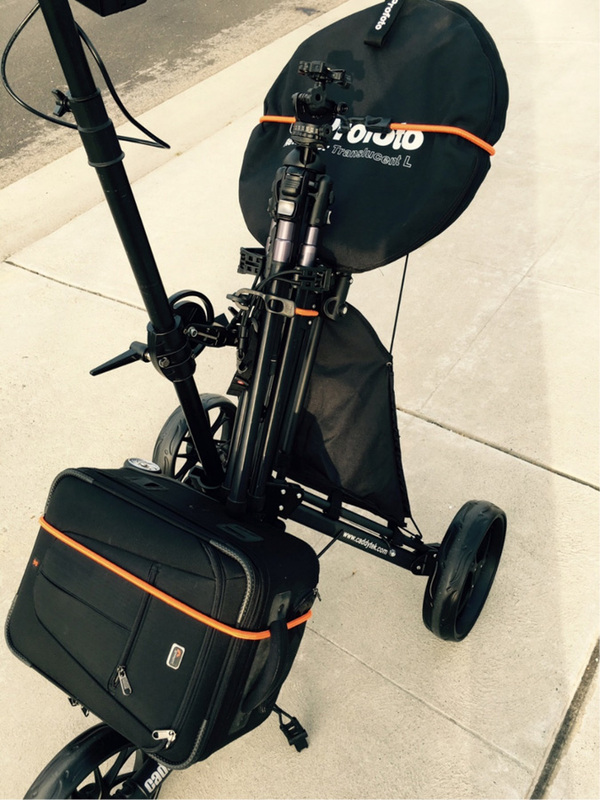 The tripod or light stand legs rest securely on the top side of the camera bag. I can even add one of my 14 lb. Matthews Hollywood Baby Jr. Triple Riser rolling stands on there, and it still works great. Perfectly balanced! 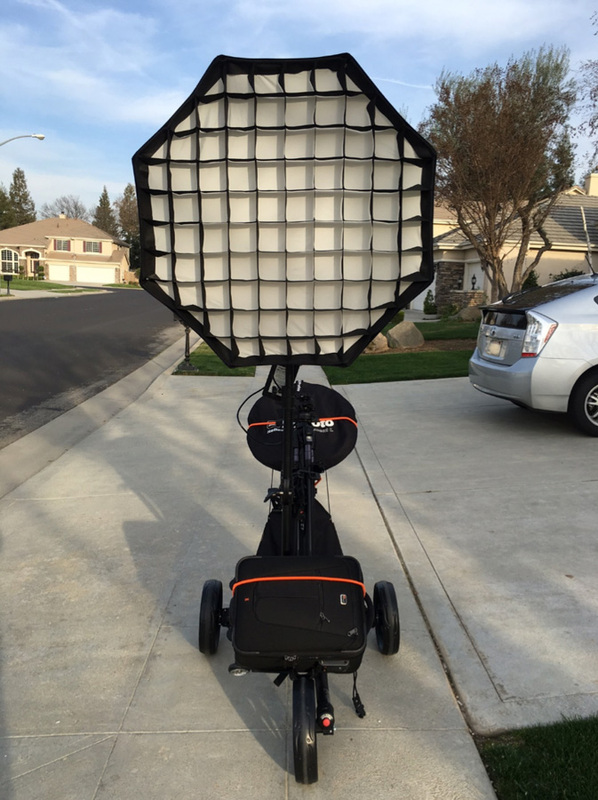 I put 2 Profoto 47” reflectors on the cart, sitting on the main cart handle. 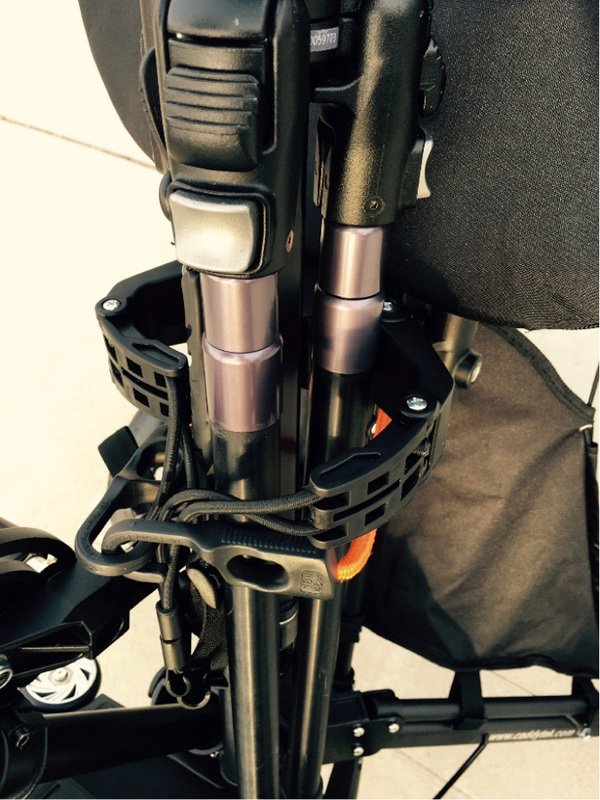 Their bottom edges sit right down on the top of the golf bag holder arms, and slip right under right under the tripod / light stand. All that’s needed is a 40” bungee cord to go around the reflectors and connect at the top. 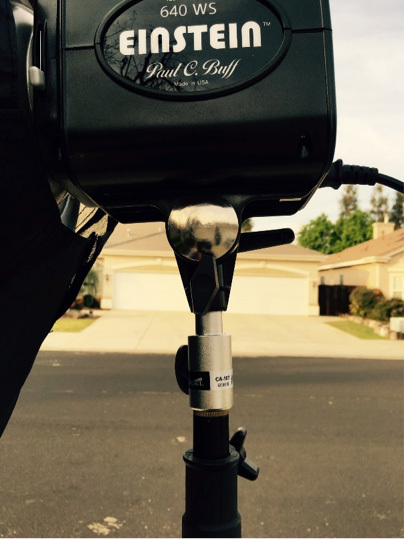 Another option would be to mount your Impact Reflector Holder to the Black Talon light post, to hold a refl ector, as shown below. It just takes a SuperClamp with a 2 ½” stud. My rig is a pricier version than the others I’ve seen, but very sturdy. You get what you need, and then enjoy it. I like the beef of this unit – as I expect to use it mostly with an Einstein 640 for its power and controllability. 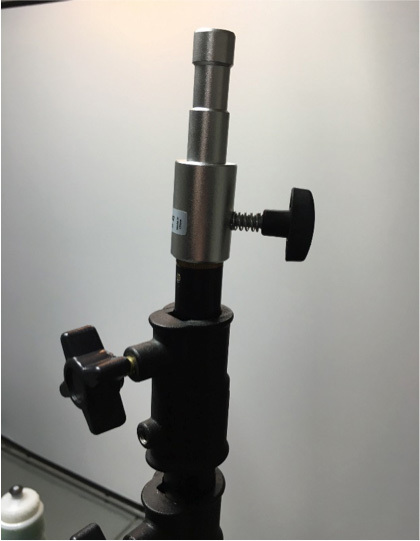 The light post will go very high if needed, has the air-cushioned safety feature, and is strong and very well balanced. 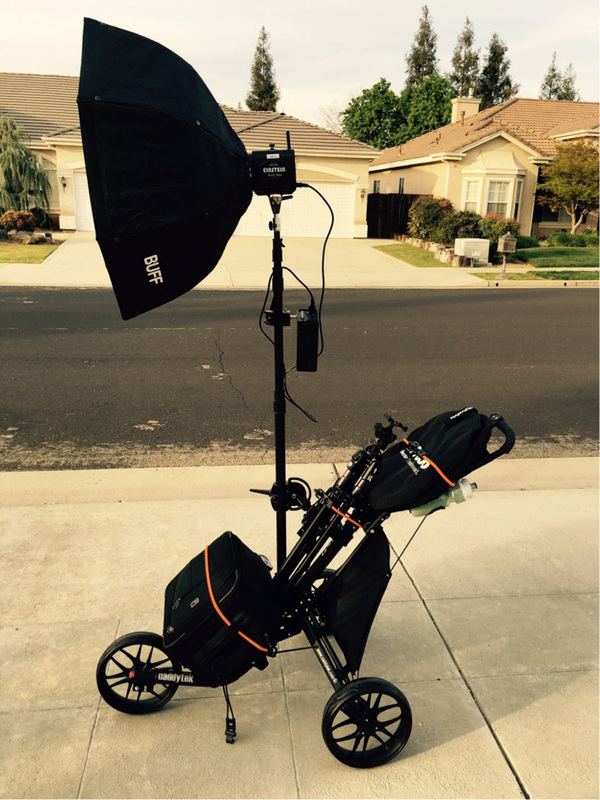 I would assume the whole setup would be even more stable with a lighter speedlight and a 26” Rapid Box. Although this cart’s very wide wheelbase gives it good lateral stability, it will not go through normal doors, although it will pass through a normal home front door and a typical side yard gate. The cart has an optional side chair that attaches to it. I won’t need that, but still pretty amazing. I have a convertible with a small trunk, and the cart fits in the trunk in any direction with lots of room to spare. 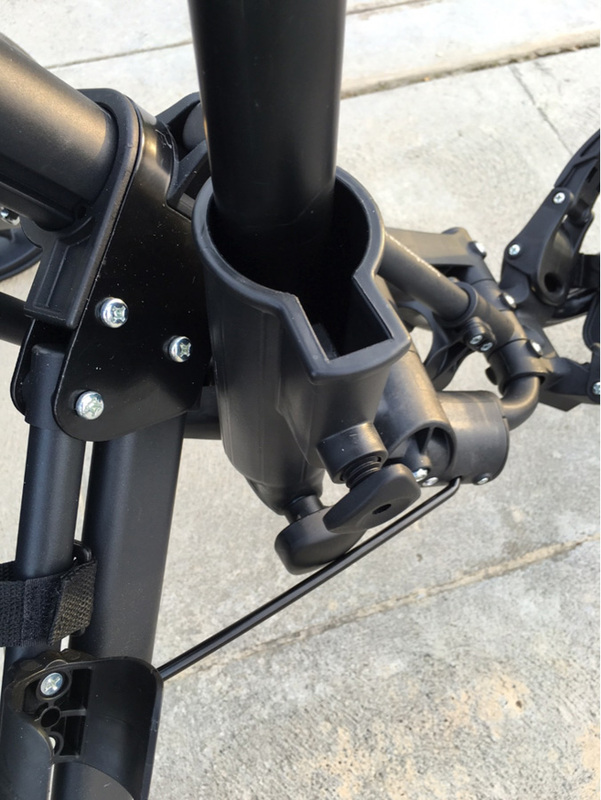 The Black Talon post and Matthews Baby Jr. stands are a really tight fit, but they make it. 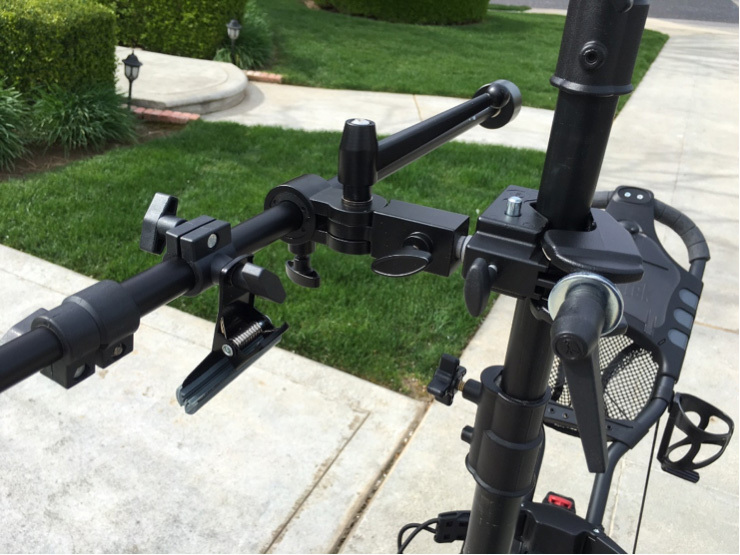 BTW – Impact makes a clone of the Black Talon light stand for $70. And if you ever need another swivel bracket for your Impact Reflector Holder, you can buy one directly from Impact for $12. And Home Depot now has nice 60” black golf cart umbrellas on sale for only $5. 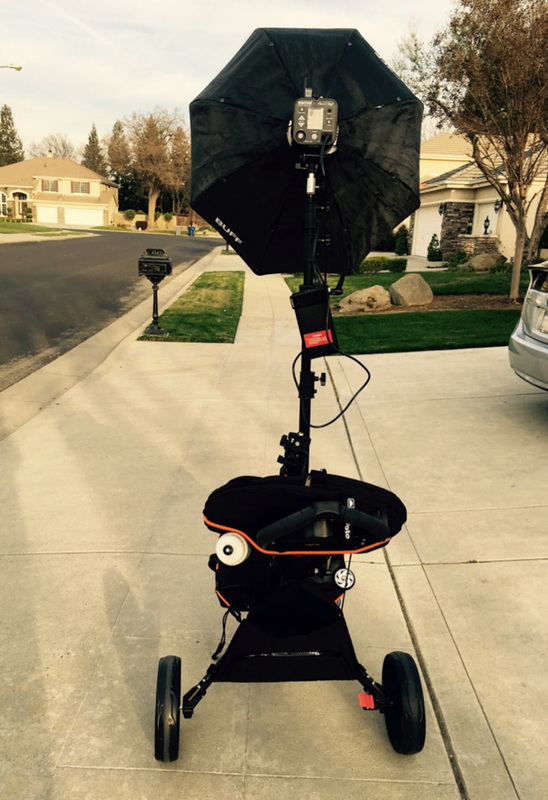 Do I use the PhotoMobile as a rolling light stand, or do I use it just to schlep my monster Matthews rolling stands and other gear to the venue and just set up the lights there? I suppose it depends on where I go and if I will be moving around to different locations. I can set up four Matthews stands in the time it takes to set up the post on the cart. Either way, the golf cart solution is ingenious! I’m ecstatic that I can schlep this much gear to and fro so effortlessly, and quickly roll to a different location. Thank you so much for your guidance, and I will let you know if I get any more ideas. This has all been quite a lot of fun actually. Great set up! Can you explain the connection of the upright post? Also how high and how low can you set the soft box? Thank you! I’m sorry — I only saw your comment now. The upright post is secured to the caddy with the Manfrotto 035RL Super Clamp but I also use velcro where it intersects the rail at the bottom to minimize movement. When moving around, I move the softbox as low as possible to avoid having it shake. I think my stand goes up to around 6 ft (keeping the height of the caddy in mind). Hi Russ.. I’m sorry I just saw your post. Unfortunately, I’m not building any of these things for sale — perhaps you can order the parts and have someone build it for you — it’s quite easy if you follow the steps.